Hardboiled eggs are un-fuckup-able, they said. They’re so easy, they said. They were right, mostly, in what they said, but they were not accounting for me. I am not special, nor am I pretending that my inability to successfully hard-boil eggs is some sort of adorable quirk. I’m a mess, it’s not cute, and no one has ever called me a scamp. But messiness isn’t really the problem here. The problem is that I have the attention span of a grape. That’s why, when I bought a $16 egg cooker for my partner for Christmas, I should have realized I was secretly buying it for me. To be clear, this is not anything resembling a sponsored post. I bought this thing (currently $26.30) with my own money, well before I was even a twinkle in The Takeout’s eye, and I suspected it might be useless. But he loves eggs, and I love eggs, and we eat a lot of eggs, and it was cheap, so I bought it. It was an excellent decision, and I am here to wholeheartedly and unreservedly recommend it to you—assuming you also, from time to time, have the attention span of a grape. The trouble with making good hard- or medium-boiled eggs, specifically, is that you can’t stop paying attention. A timer is nice and all, but if you’re an attention grape (a raisin, on a bad day), you can hear a timer go off, tell yourself you’ll check on it in 30 seconds, and then remember it an hour later. I know this to be true, for I have done so myself. On many occasions. 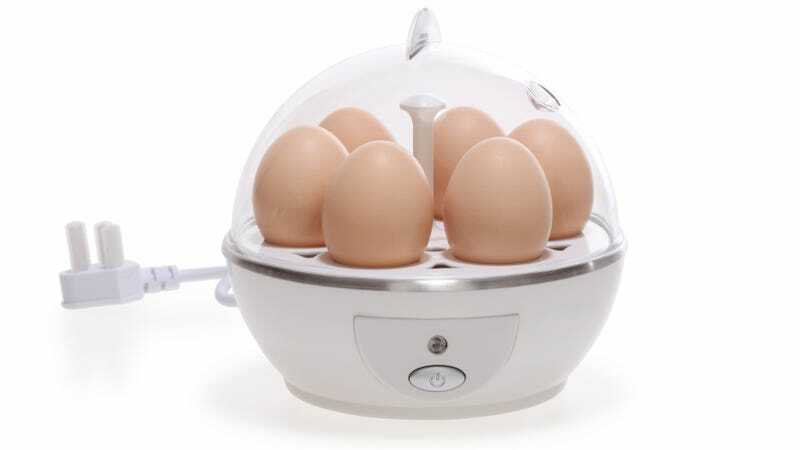 Some specifics: the egg cooker I purchased cooks six eggs at a time. 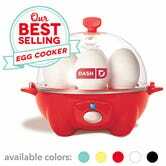 (You can also find innumerable egg cookers on your e-commerce site of choice.) It can do hard, soft, and medium-boiled eggs, as well as poached eggs, scrambled eggs, and omelets. I’ve tried the first three, and can assure you that this dumb thing does masterful work. I remain skeptical of the back half of that list, but who knows? And it makes it impossible to screw up hard-boiled eggs, for which I am grateful. Yes, eggs are boring. Who cares, this thing is wonderful. It works like this: You take a small plastic cup and fill it with water; levels are designated depending on the way you want your eggs cooked. On the bottom of that cup is a little spike. You pour the water into the cooker, poke all the eggs with the spike, and press the start button. Minutes later, a loud as hell timer sounds—the water is gone, your eggs are done. Simple. You take off the lid, and there are your goddamn perfectly cooked eggs, ready for you. With the hard-boiled eggs, there’s no need for an ice-bath, and they peel really well. With the medium-boiled eggs, it achieves that perfect in-between lava-state every time, something that someone with a grape’s attention span could rarely otherwise achieve. As for the soft-boiled eggs, they’re soft-boiled, and thus not for me. I am assured by those who enjoy them, however, that they are a delight. I’m not one for overly specific appliances. My kitchen is a small one, and cupboard space is hard to come by. But the egg cooker has a treasured corner of one shelf, and it comes off that shelf a lot. It may be specific, and it may do something I could absolutely do on my own. But there’s something to be said for a gadget that does exactly what it says, and does so in a way that ensures you eat just a little bit better. If it means I have one less reason to be pissed at myself for screwing things up in the kitchen, so much the better. Are there any benefits to drinking raw eggs?